On the 16 April 1954 something momentous happened in New Cross London. It was, as it were, an American import and it signalled the start of something big. An explosion of on track action that combined a gladitorial approach to motorsport that had never been seen before in the UK. Stock car racing had arrived! The original cars were aptly named as they were basically standard (stock) saloons that had been lightly modified. Wheel arches removed, bumpers and roll bars added. In stock car racing size mattered (and still does) so the majority of cars were American imports but with some larger European saloon cars featuring too. 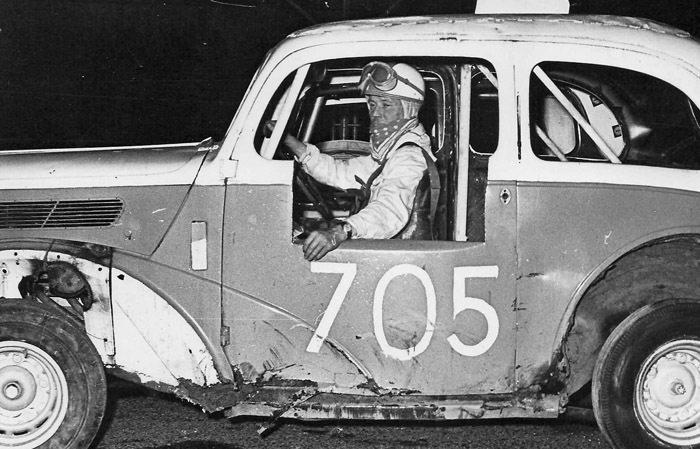 They weren’t things of beauty because they had a job to do – survive the close quarters, push and shove of racing of a quarter mile oval track. For five or so years drivers fought it out on tracks up and down the country and interest in the sport grew rapidly. Then came the early sixties and things started to get serious. The resemblance to road-going cousins rapidly became tenuous in the extreme as a new breed of racer evolved. 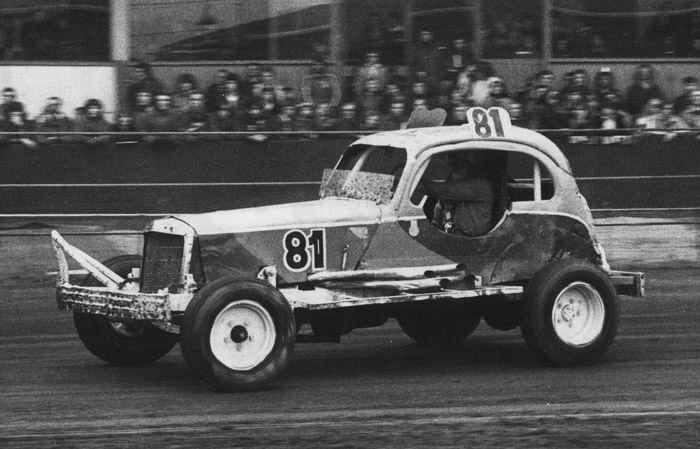 Custom built chassis, powered by small block Chevy V8s (the one carry over from the original racers) topped with vestigial bodywork covering the driver compartment. The new beasts took to the tracks and proved pretty much an instant hit. Now the era of high performance oval racing had arrived. Big time! 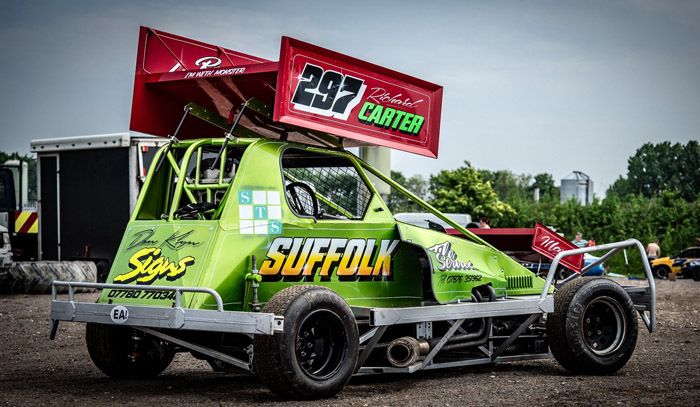 As these ‘thoroughbreds’ continued to grow in popularity, the original stock cars began their evolution. One was into what we now know as banger racing. A demolition derby where the last man or woman standing is crowned the winner. The other was into Hot Rods which is not a contact sport but relied more on driver skill than brute force to win the day. 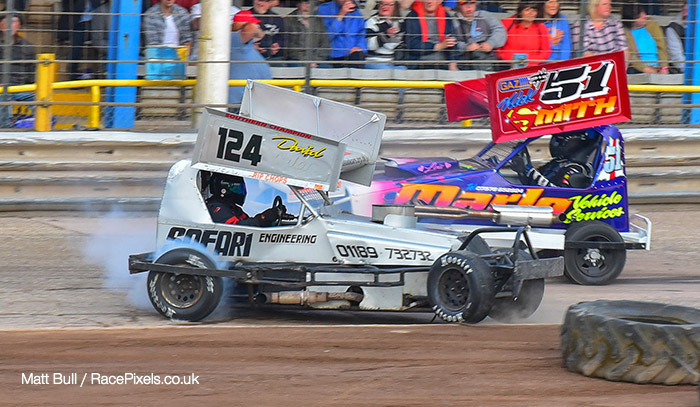 But while they were battling it out on over thirty tracks up and down the country, the V8 powered F1 Stock Cars became the class of the field and, in many ways, so it has continued even until today. Interestingly the cars on the surface look very similar to the originals, albeit now they sport wings the size of a garden shed on their roofs. Whether they create any downforce is probably a moot point, but they definitely make it easier to follow in the heat of the action. Incidentally you can tell the status of the driver by the colour of his wing with a gold top being the colour to beat. Meanwhile upfront, the small block Chevy is still the chosen power plant but now the stakes have been upped with engine fettlers extracting 700 plus horsepower and well over 600 pounds of torque. That translates to speeds in the region of 80 to 90mph so drivers are kept busy, bearing in mind that the cars weigh in at 1,350 to 1,500 and you can see that underpowered they’re not! That too is why they boast one luxury. Power steering. Manhandling one of these babies for sixteen mad laps without power steering is not for the weak of spirit. Or muscle. Chassis design of course has become more sophisticated and in general is split between three constructors. Like all forms of motorsport, there are those for whom budget is no object and hope that throwing enough money at it will guarantee them a place on the podium. And yes it might. But the good news is you could equally go and pick up a second or third hand racer for under £5k and still find yourself at the sharp end of the grid. Well it would be if it was true. But it’s not. Because with these guys the better you are the further back you start on the grid. However the £5k budget is highly possible and that’s because although there is a fair bit of pushing and shoving, generally it is done with finesse so the cars can survive season after season without noticeable damage. Bit like some of the drivers. Peter Scott, who is well north of 60, is still going strong after 40 years of competition, though he has had the odd knee joint or two replaced. 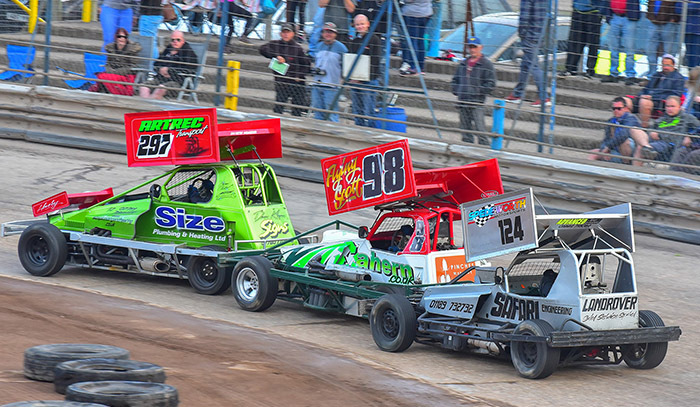 The competitive spirit which also extends to the two main organising bodies, BriSCA and Spedeworth. The two camps have divided the UK following and tend to race among themselves with only the occasional foray into ‘enemy’ country. But that’s also down to the fact that the two camps favour different surfaces on their oval tracks. 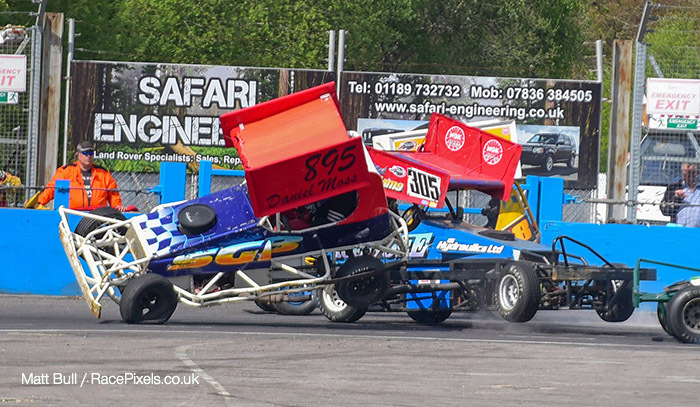 Spedeworth who are the ‘southern posse’ generally race on tarmac or concrete, whereas BriSCA prefer shale, so you can appreciate the handling characteristics on the cars are somewhat different. While the sport does not attract the same following as it did in its heyday, it still rates very highly with its fans and competitors. The number of tracks may have diminished, but the fervour remains. In September alone Spedeworth has almost 30 race meetings acrosss all its formula on the calendar which is why on the basis of aggregate attendance, the sport is the most popular in the UK. So catching the action should not be a problem. To find out more visit the Spedeworth website and get yourself a piece of the action.